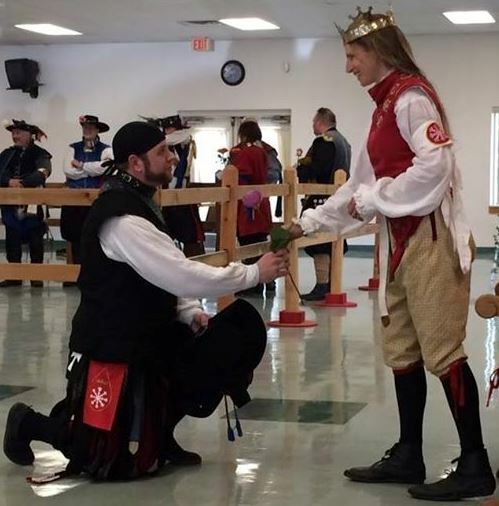 Lord Jacob Martinson receives a rose from Her Majesty before winning her tournament. Photo by Lady Antoinette de Lorraine. Unto the Good Gentles of Abhainn Ciach Ghlais and all who staffed the Queen’s Rapier Championship does Ariella, Regina, send fond Thanks! The Queen’s Rapier event went wonderfully, with much delicious food and gracious event staff. The air-conditioned site was so welcome and held the four large Kingdom lists perfectly. Lady Antoinette de Lorraine, the autocrat, can be proud of her staff, including the Royalty Liaison, for taking care of all Royal needs. The Rose Garden special reception and welcoming drinks for all further enhanced the hospitality of your Shire. The Championship tournament and further bear pit tournaments were efficiently run thanks to the marshals and the MOL, Baroness Aemelia Soteria. All the fencers showed chivalry. Vivant to all who entered and vivat to My new Champion Lord Jacob Martinson!